February is an exciting month because of the Greater Milwaukee Auto Show. Heiser Automotive Group is excited to be a part of such a great annual event. Representatives from all Heiser Automotive Group locations will be there to help answer your questions and show you some of the great vehicles at both the new vehicle display and preowned section of the show. Located at the Frontier Airlines Center, formerly the Midwest Airlines Center, this year’s show has proven to be the best yet! Greater Milwaukee Auto Show Discounts & Promotions This year’s show has offered many opportunities to save money and win big.The show now is offering E-ticket opportunities. 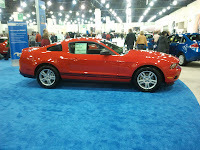 E-tickets may be purchased and downloaded from the official auto show web site: click here to check it out. E-ticket holders can avoid waiting in box office ticket lines by purchasing tickets in advance. Adult E-tickets are $9 each, which gives attendees a discount of $1.